La La Land (2016) – WHO IS THE MAN FROM KRYPTON? An aspiring actress with a love for classical cinema crosses path with a musician with a love for classical jazz and after resistance from both sides, they fall in love. Although they are in Hollywood, they are about to find out that not everything is like in a movie. Damien Chazelle previously directed ‘Whiplash’ which was a terrific film, let down by not taking enough visual risks, Chazelle’s new film ‘La La Land’ takes so many risks visually that it’s fantastic to see, not all land great of course but it is so refreshing, it’s just a shame that the story of ‘La La Land’ is far weaker than that of ‘Whiplash’. The story follows a very typical rom-com type story structure and although the musical numbers are very good and add a bit of life into an otherwise drab plot, it’s not enough to save it and keep an audience invested. The performances are astounding, far and away the best part of this film, Emma Stone and Ryan Gosling just have this natural chemistry on screen that feels like absolute magic. When you combine this magic with what are some characters that are written really well, with some great dialogue, as well as some genuinely funny comedic moments that allow them to stretch their comedic chops, it makes them so fun to watch. The film really aimed to get you invested in these two characters, and while it is successful to a degree, there felt like a lot of false ploys for emotion. The ending in particular didn’t have much of an emotional bite as it feels like the film should have had, it was simply too paint-by-numbers, albeit it using different colours. 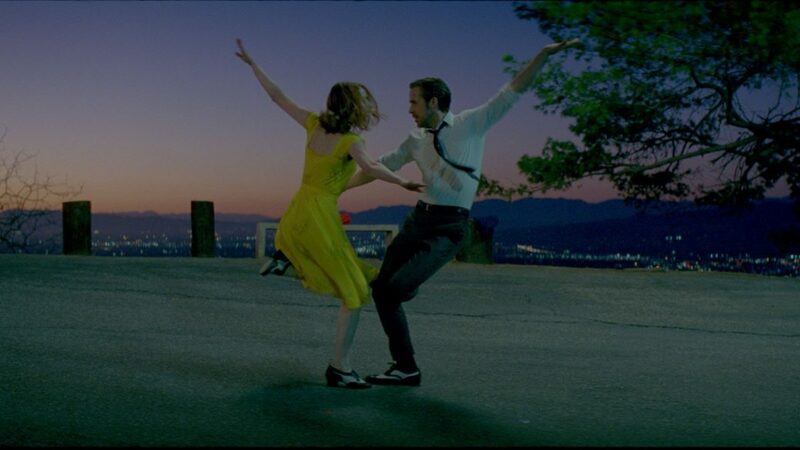 It’s very hard not to compare the film to ‘Whiplash’, as well as having the same director, ‘La La Land’ feels like a spiritual sequel to it, combined with what is obviously Chazelle’s adoration for jazz music. The ending to ‘Whiplash’ was explosive, the ending to ‘La La Land’ was implosive and it was a weaker film for it.